Microcontroller based automate controller is a project design of a system that is used in operating a gate automatically. The system opens the gate automatically when a human being or car is about to enter a compound or exit a compound. The system works by sensing the light rays from the headlamp of the vehicle. The light ray is sensed and signal is used in operating the gate. Different blocks of circuit are put together to ensure that the system works perfectly as desired. The blocks include; the power supply unit, the control unit, the sensor unit, and drive unit. The power supply unit powers on the entire system, it supplies appropriate dc signal to where it is needed. The supply unit is made up of a 12volts step down transformer, a bridge rectifier circuit, a filter capacitor and a voltage regulator IC. The control unit receives signal from the sensor section to control the remaining part of the system. The control section is the logical part of the system and decides the state of the entire system depending on the signal from the sensor unit. The control section carries its operation with use of a microcontroller ATMEL89S52. The sensor unit receives signals from the headlamp of the vehicle or the human being and sends signals to indicate that a human being or car is present. This is achieved with the use a light dependent resistors. The drive unit is a DC motor which carries the gate to a specific direction as indicated by the microcontroller. In the past, many systems that are designed by man are normally operated manually. This mode of operation is accompanied with many defects or disadvantages. Some of the disadvantages involve stress undergone by the operator; the operator is also exposed to health hazards when carrying out his or her duties. These health hazards might be in terms of electrocution, skin burn or bruises. To overcome the above mentioned disadvantages that are associated with manual operation of systems, the recent systems are designed with mechanisms that enable them to carry out the required operations automatically. To this effect, the system carries out the required operation by them. The mechanism of the system can only be altered during servicing of the machine. With automatic operation of systems, the stress involved with handling the systems are reduced drastically. The automatic gate control system is one of the systems that operate automatically. 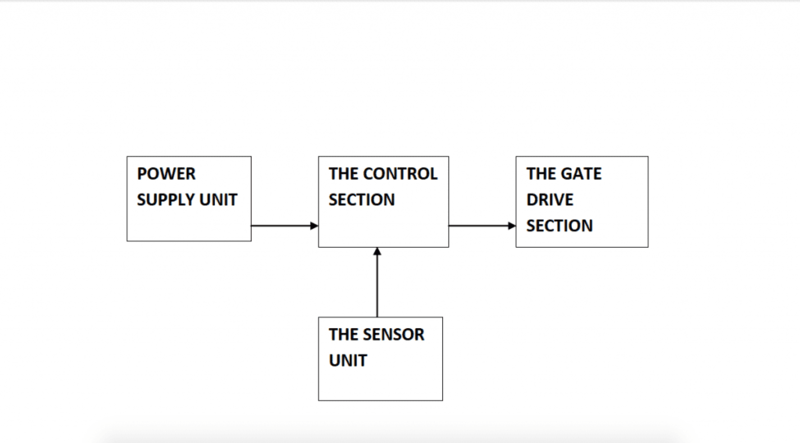 The system simply detects the presence of object at the front of the gate and then, opens the doors of the gate automatically. It incorporates sensors that are mounted at strategic positions and which has the capability of detecting objects. These systems are used in public offices where people often make use of the doors. The main aim of the design is to practically obtain a system that opens and closes a given gate automatically, when there is presence of cars or persons. The system is designed in such a way that it has sensors that senses the presence of people. Voltage regulation: this is simply, the control of voltage as needed by the design. Voltage regulation ensures that a specific and steady voltage supply is provided for the system operation. Electromagnetic switch: this is the contact making that exists between terminal of electronic components. These switches are carried through a process known as electromagnetic induction. Examples of devices that can perform this action is the relay. Erasable programmable read only memory (EPROM): this is a type of memory device which can be programmed. The device also has program erasing ability if it is to be reprogrammed. Chapter one is the introductory chapter that gives the background of the project, aim and objective, the scope and organization of the project. Chapter Two handles the literature review; information on previous work relevant to the topic. In chapter three, I discussed the practical system analysis of the project. Also discussed is the requirement analysis, which is all the information, gathered from a wide research on microcontroller over/under voltage protective system. Chapter four deals with the design procedure, construction steps, packaging and cost of components. Chapter five contains the test result, summary, conclusion and recommendations for further work.